Glazed cranberry chicken is a festive, easy-to-prepare holiday meal. 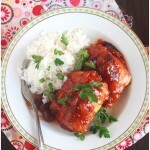 Chicken thighs are covered in a savory glaze of fresh cranberries, onion, and sage. In a small bowl, combine 3 tablespoons butter, 1 teaspoon thyme, 1/2 teaspoon salt, and 1/4 teaspoon pepper. Gently lift chicken skin and rub mixture evenly under the skin. Place on a rimmed baking sheet, skin side up, and drizzle top of chicken breasts with olive oil. Sprinkle with additional salt, place in the oven, and roast until skin is golden brown and the internal temperature on a meat thermometer reaches 180 degrees, about 35-45 minutes. Allow chicken to rest 15 minutes before serving. Meanwhile, melt remaining tablespoon butter in a large saucepan over medium heat. Add onion and sauté, stirring occasionally until translucent, about 8 minutes. Add sage and remaining 1/2 teaspoon thyme. Cook for an additional minute. Add broth; simmer until reduced to 1 1/2 cups, about 10 to 15 minutes. Strain mixture, discard solids, and return to saucepan. Add cranberries and sugar. Bring to a boil and cook until berries burst, about 5 - 8 minutes. Whisk in cornstarch mixture and return to a boil. Cook until slightly thickened, about 1 to 2 minutes more. Remove from heat. Season with salt and pepper. Serve over roasted chicken breasts.